Sunday, February 24th, 2019 at 2:00 P.M. Location: 1206 Stewart, Winfield Ks. 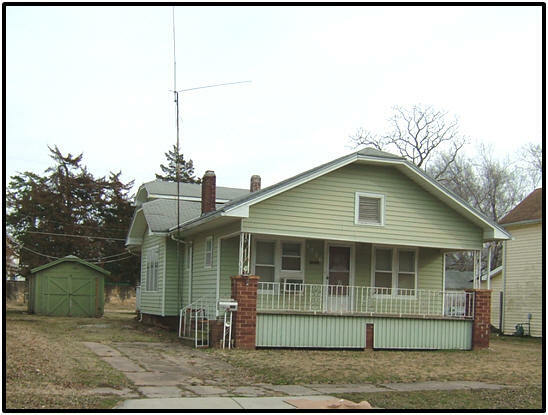 LOCATION: 1206 Stewart, Winfield, Ks. General Description: This 3 bedroom, 1bath home has 1,189 sq. ft of living area, floor furnace heat, window air and a small unfinished basement. This is basically a 1 story home plus an upstairs bedroom in the back portion of the house. This home has mostly hardwood floors, a gas fireplace, storm windows and metal siding. There is also a frame one car garage and small metal utility building in the back yard. TAXES: $1,001.10 (2018) 2018 and all previous years taxes will be paid in full. 2019 taxes will be prorated to date of closing based on 2018 tax figure. TERMS: $2,500.00 non-refundable deposit at time of auction, balance due at closing on or before March 25, 2019. Property is not selling subject to finance. Walnut Valley Title Co. will furnish title insurance and act as escrow & closing agent. Costs of title insurance and closing fee will be split between Buyer & Seller. PROPERTY CONDITION REPORT: Every effort has been made by the Seller and Auctioneer to disclose any & all known defects, however this property is being sold “as is, where is” without warranty, either expressed or implied. All prospective buyers are encouraged to view the property and conduct any inspections deemed necessary prior to bidding at the auction. Only good title is guaranteed. Statements made at auction take precedence over all previous advertising.